Beef tenderloin steaks are crusted with peppercorns and served with an easy cognac cream sauce (no flambéing!) 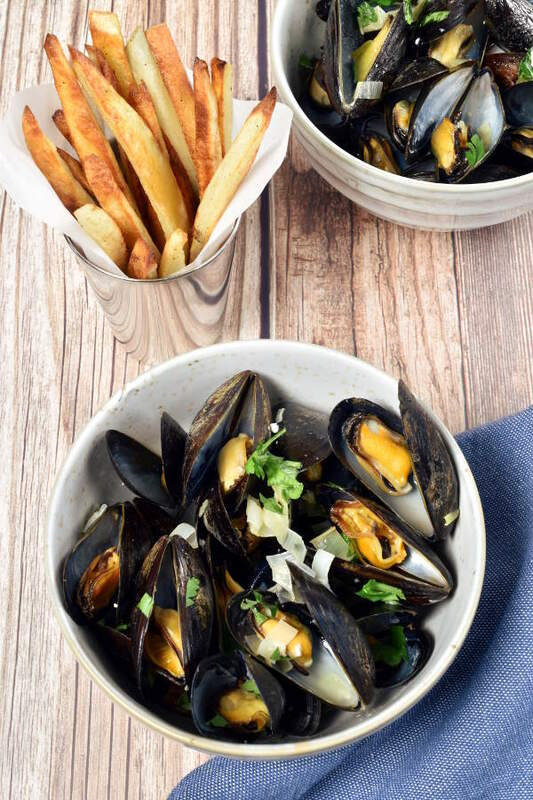 Enjoy this classic French bistro meal with oven fries, a green salad, and a bold red wine. 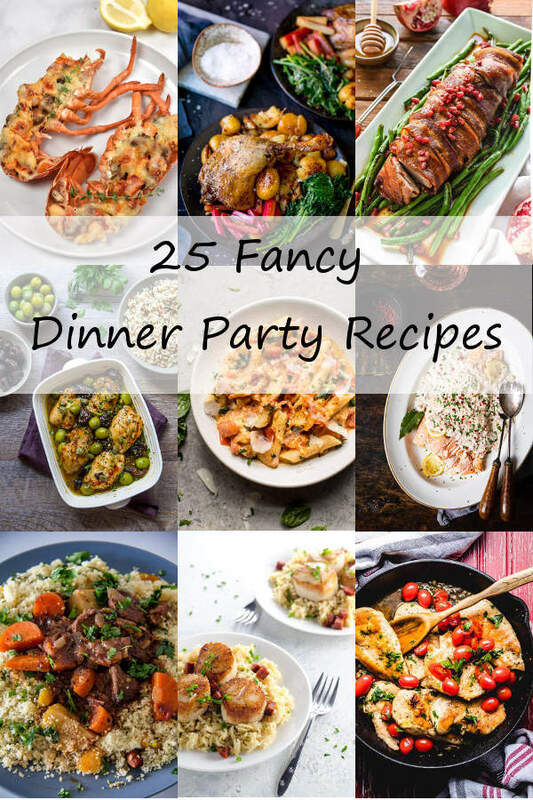 When I think of fancy romantic date night dinners, my mind always goes to French food, like Duck Breast with Cherry Sauce and Duck Fat Fried Potatoes, Roast Rack of Lamb with Rosemary Fried Potatoes, or Lobster Thermidor. My next thought is always steak. I do love a good steak and potato dish, like my Steak with Homemade Potato Chips, my take on Steak Frites. 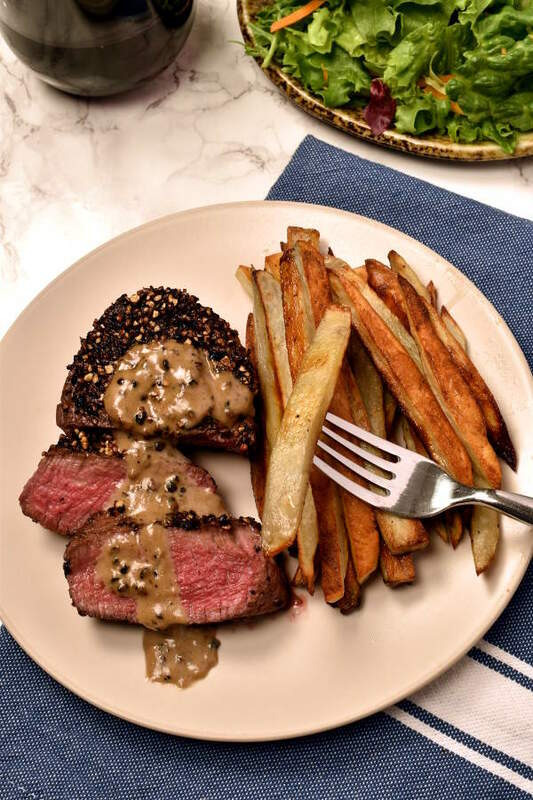 Steak au Poivre is a pretty easy meal, ready in only 40 minutes. 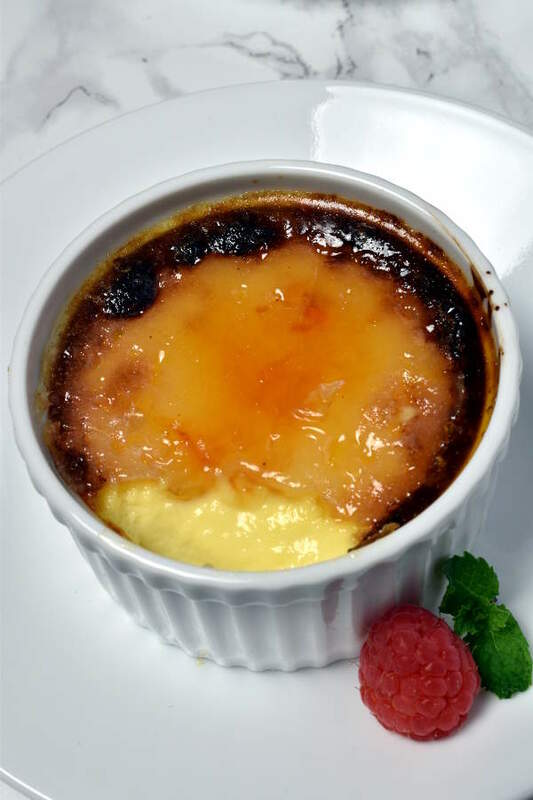 While this recipe uses expensive ingredients, obviously it’s cheaper than a flight to Paris (or a restaurant meal). 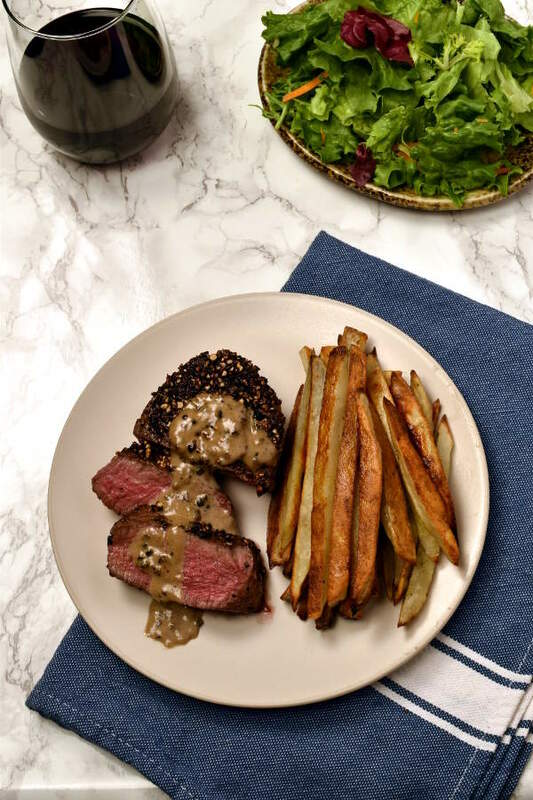 Steak au Poivre is traditionally made with beef tenderloin steaks, aka filet mignon, aka my favorite steak. I think this recipe would also be great with a ribeye or strip steak, if you want to cut the cost a little. If you make it with a larger steak, however, I recommend doubling the sauce. The only real requirement for this recipe is you have to like black pepper. The steak is covered on both sides with crushed peppercorns. I don’t love spicy food, but I find the strong pepper flavor complements that rich flavor of a quality steak. For my side dish, I thought about making some kind of fried potatoes on the stovetop. But I decided to save that idea for another recipe and make something using the oven. With the oven fries, you put them in the oven and leave them there so there’s less going on on the stovetop while you cook the steak and the sauce. We both love oven fries, so I’ll take any excuse to make them. Here are some of the main ingredients. 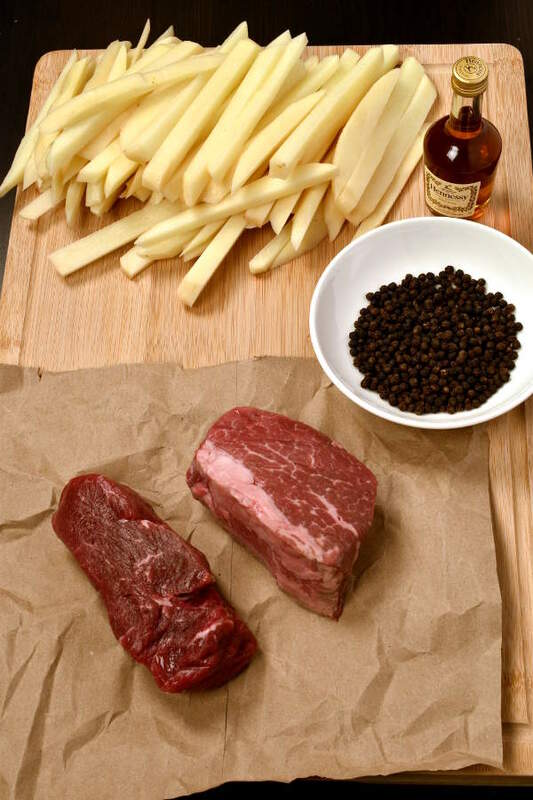 We have two beef tenderloin steaks, three tablespoons of whole black peppercorns, two russet potatoes cut into fries, and a small container of cognac. We don’t drink brandy or liqueur, but I’ll often see recipes using just one tablespoon of some specific type of brandy. So I buy those mini-bottles at the supermarket for use in cooking. It’s not as cost efficient as buying a larger bottle, but if we bought a large bottle, we’d never use it up. I started out by toasting the peppercorns, which helps bring out their flavor. After the peppercorns cool down, it’s time to crush them. I put them in a large Ziploc bag and pounded them with a meat mallet. You could also use a rolling pin or a heavy skillet. While this made some tiny holes in the bag, the peppercorns all stayed put. Aim for the peppercorns to be halved or quartered, not ground up like you normally use them. Look at that nice crushed peppercorn crust. For the pan sauce, typically you would pour the cognac into the pan with the leftover brown bits from the steak and flambé it, i.e. literally set it on fire. This burns off the alcohol and leaves the sauce with the flavor from the cognac. Call me chicken, but I can’t work up the nerve to purposely light something on fire in the kitchen. It’s really not necessary, you can just cook it for a few minutes and all the alcohol will cook out. For the rest of the sauce, you add beef broth, reduce it, and finish with cream. Some recipes would have you add the leftover crushed peppercorns (from when you first coated the steak) to the sauce before boiling. I think the steak has plenty of pepper flavor as is. Around the same time the sauce was done, my fries reached golden brown crispy perfection. Okay, oven fries aren’t really the same as deep-fried French fries, but they’re the best kind of fries to make at home. Light the candles, open some red wine, and enjoy! Salt steaks: Rub kosher salt all over steaks on both sides. Leave steaks out of the fridge to come to room temperature. Toast peppercorns: Heat a skillet large enough to hold both steaks over medium heat. Add peppercorns and cook, stirring often, for 2-3 minutes, until fragrant. Be careful not to let them burn. 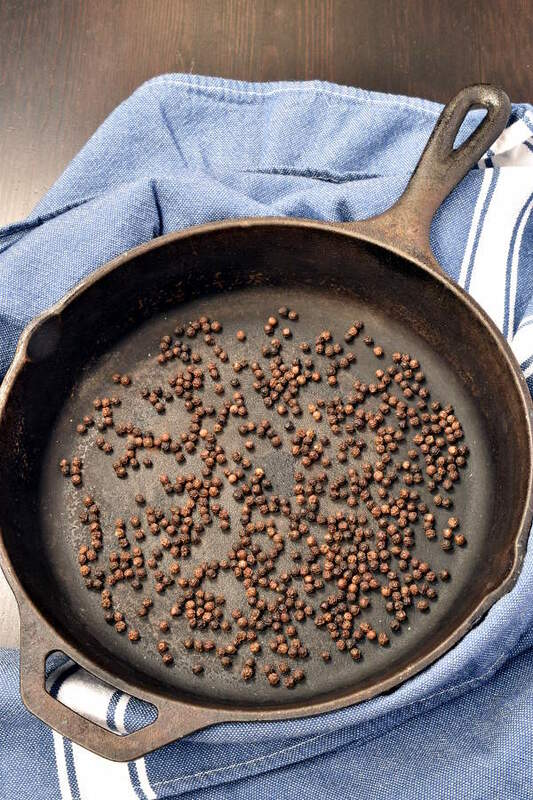 Transfer peppercorns to a plate to cool. 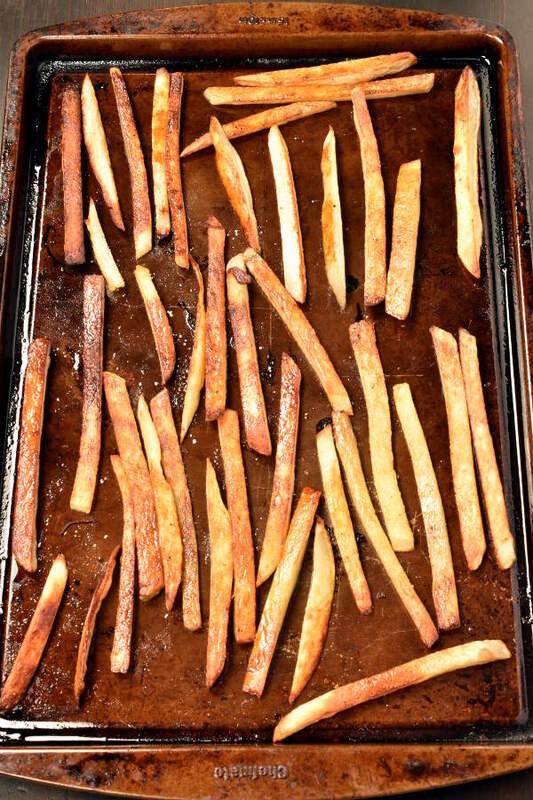 If you are making the oven fries, at this point, skip to the Fries part of the recipe and begin making those. After the fries go into the oven, continue with steps below to cook the steak. 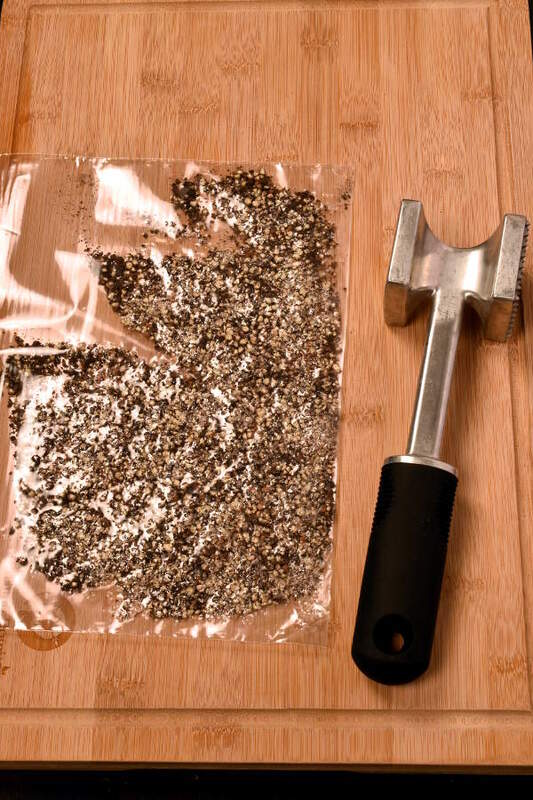 Crush peppercorns and coat steak: Put peppercorns in a Ziploc bag, push out extra air, and seal closed. Place the bag over a cutting board. Use a meat mallet, rolling pin, or heavy pan to pound the peppercorns until they are crushed. (You want most of the peppercorns to be broken into halves or quarters, not ground up.) Spread out crushed peppercorns on a plate. Press the steaks into the crushed peppercorns on both sides to coat. Discard remaining peppercorns. 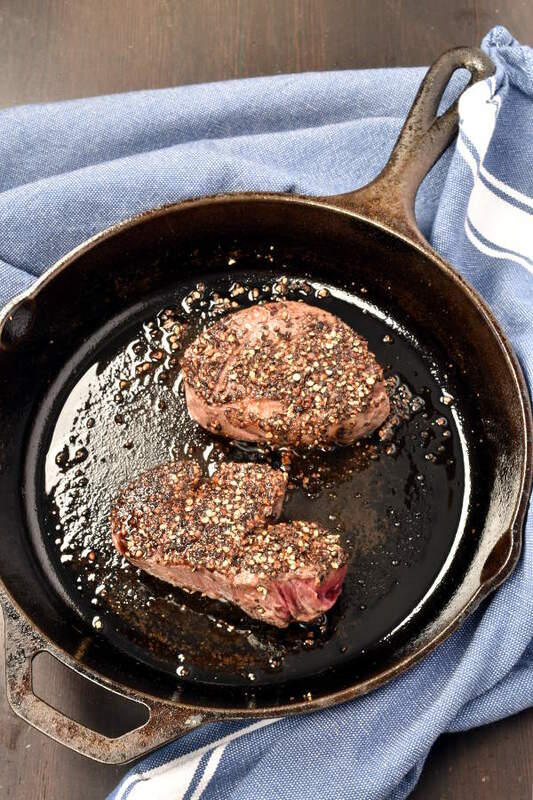 Cook steak: Heat oil in the same skillet used to toast peppercorns over medium heat. Add steaks and cook for 4-5 minutes per side for medium-rare. Don’t let the heat get too high or peppercorns will burn. Remove steaks to a plate and tent loosely with aluminum foil. Make the sauce while steak rests: Use the same skillet the steaks were cooked in, but remove from stove. Pour in cognac and scrape up browned bits from the bottom of the pan. Put back on stove and cook over medium-high heat until brandy is mostly evaporated. Pour in beef broth. Bring to a boil and cook for 3-4 minutes to reduce. Add cream and boil until thickened, about 3 more minutes. Spoon sauce over steaks just before serving. Preheat oven to 425 degrees. Spray 2 baking pans generously with cooking spray. Divide potatoes between the 2 pans. Drizzle 1 tablespoon olive oil over each pan. Season with salt and pepper. Toss potatoes so they get evenly coated with oil and seasoning. Lay out in a single layer on each pan. Bake for 10 minutes, then flip over and bake for 10-12 more minutes, until fries are browned and slightly crispy. If the fries are done before the steak is ready, put them back in the oven for the last few minutes as you’re making the sauce to keep them hot and crispy. If making with a larger steak, like a ribeye or strip steak, double the amount of sauce. Thanks Camila! I make those fries with everything! I love steak and I love fries so this is pretty much the perfect combination!! Thanks Stephanie! I know we’ll never get sick of steak and potatoes! I already can smell the steak with peppercorn on my mind. Actually, I am craving this right now. 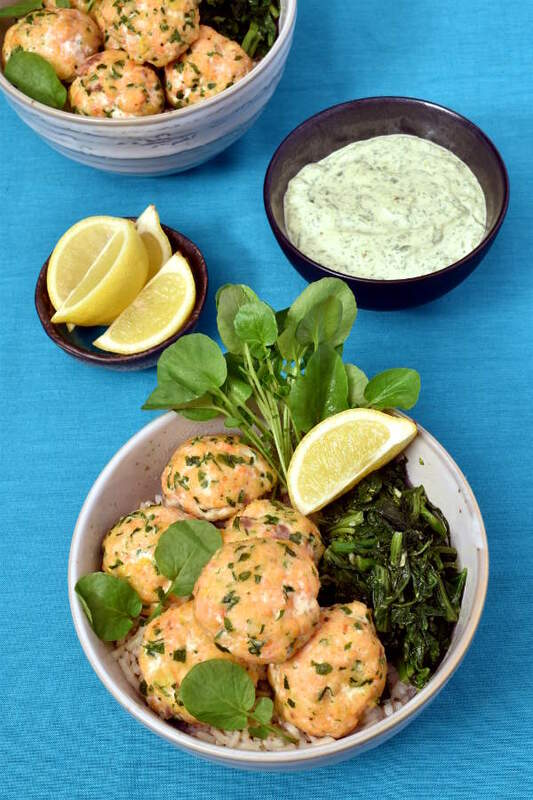 definitely trying this recipe tonight for dinner. This looks so good! I love pepper and will have to try this! And those fries! What a delicious meal! 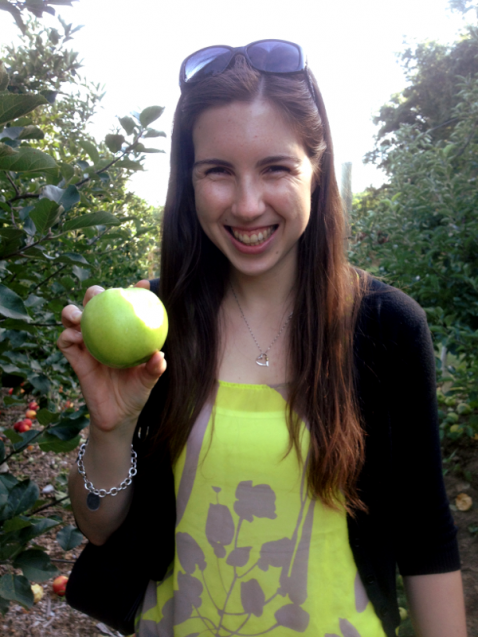 Thanks Lisa, hope you love it!